I’d always wanted to do a story on Replacements, but had no idea it would be sooooo much fun! Here’s my article, which originally ran in the Washington Post on April 27, 2014, and has since been reprinted in several other newspapers. Details for visiting are below the story. The kicker: I was cleaning out the basement after this ran and discovered yet another box of inherited crystal, worth enough money to warrant a return visit. This time I’m making a point of meeting owner Bob Page. Can’t wait! When Laurie Oliver, running the sellers’ counter at Replacements, Ltd., said that it might take 90 minutes to process my six plastic tubs of china, silver and crystal, my first thought was, I’m pretty sure I’ll need more time than that. For years, I’d driven past the gigantic showroom and warehouse (“the size of eight football fields!” according to the Web site), visible along Interstate 85 just east of Greensboro, N.C., thinking that I wanted to drop in. Not because I like to shop (I don’t), but because the scale and mission of the place fascinate me. The aptly named company maintains the world’s largest inventory of old and new china, crystal, silver and collectibles – some 12 million pieces representing more than 400,000 patterns. Broke your Margarete Bridal Rose salad plate? Look no further. Want some cash for your Spiegelau Aida water goblet? Step right up. The bulk of the company’s dealings, both buying and selling, occur online, on the phone, and through parcel delivery. 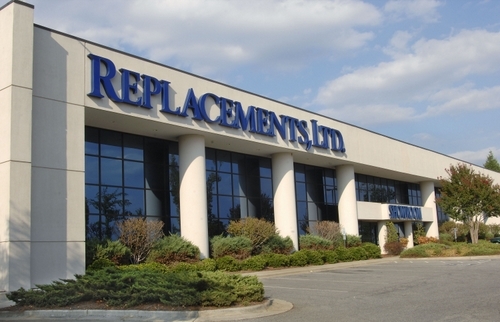 But for more than 55,000 annual visitors, Replacements transforms into much more than a center of commerce. I experienced it as a dog park, a gay rights center, an inventory-handling machine, a tableware museum and a place of worship – or at least profound appreciation – for benevolent leader Bob Page. 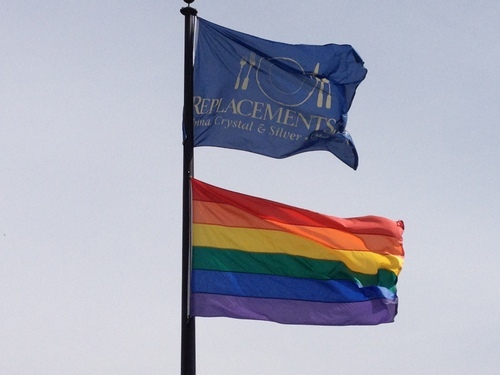 The rainbow flag flies under the Replacements logo. Owner and founder Bob Page is known as a gay rights leader locally and statewide. The first thing I noticed was the tall pole holding two flapping flags – one stamped with the Replacements logo and the other covered in rainbow stripes, the universal gay symbol. Owner Page, once closeted, is now known as a gay rights leader locally and statewide, a bold proclamation for a mainstream business owner in these parts. As I was unloading my boxes onto a cart, two employees passed by, one walking a black Lab and the other a Pomeranian, lending truth to the sign on the door that reads, “Well-behaved pets welcome.” Staffers told me that though dogs rule, visitors have also brought cats on leashes and even a pot-bellied pig. From there, I inched through a hall of fame, marveling at the media coverage and the dozens of awards that the 69-year-old Page has received since he grew Replacements from a flea-market hobby to an attic business in 1981 and now an industry with more than 430 employees and $80 million in revenue. Stories detailed the former state auditor’s community philanthropy, his adoption of infant Vietnamese twin boys (now 14 years old) with his partner, workplace accolades, and of course, Replacements’ expertise in tracking down missing tableware. Half the photographs seemed to spotlight dogs, including Page’s now-deceased short-haired miniature dachshunds (my breed of choice, too!). 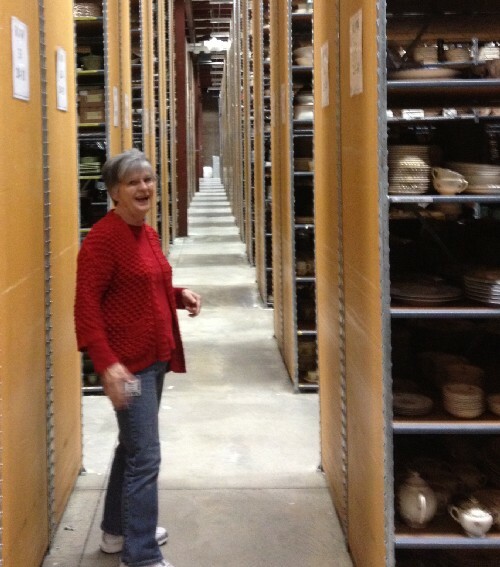 Guide Phyllis Gorman walks down the aisle between rows of warehouse storage on the way to the packing department. I landed in the sparkling showroom just as a tour was starting up. On this frigid weekday morning there were only a few people in the showroom, and I was thrilled to have guide Phyllis Gorman all to myself. “Let me start by telling you a bit about Bob Page,” she said, not knowing that I’d just digested his life story. “Is he here now?” I asked, hoping to snag a glimpse of my new hero. Although many old and new items in the showroom are affordable, part of the stock is high end, like Royal Copenhagen’s botany-inspired Flora Danica, which Gorman led me to see inside its shiny and secure case. My mouth gaped open to the size of a $1,000 saucer. 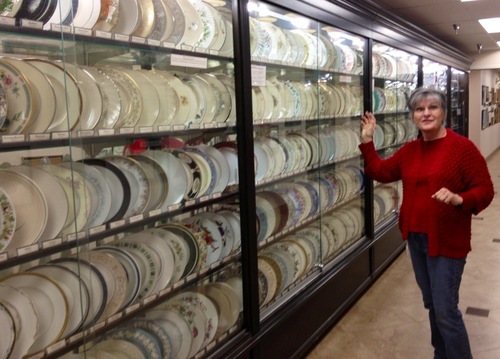 Guide Phyllis Gorman points to the “Great Wall of China,“ displaying Replacement’s 500 most popular china patterns out of the 265,000 it carries. We stopped at the “Great Wall of China,” long glass-fronted cases holding Replacements’ 500 most popular china patterns, out of 265,000 active and discontinued patterns from 5,500 manufacturers. That case was followed by two more, holding the top 150 crystal and silver patterns. From there, we popped by the packing department, which ships out around 2,500 orders a day, double during the holidays. Then we passed the call center, the research department, the restoration and polishing stations, and the artisan station, where craftspeople will make, say, a lamp out of your Great Aunt Mildred’s favorite teapot. Sure enough, Oliver called mid-tour to tell me that I could pick up my check and rejects (my description, not hers). No rush, she said, when I pleaded for more time. 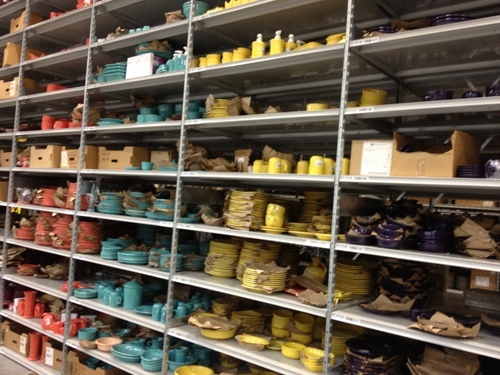 The shelves holding Fiestaware are among the most colorful in Replacements’ massive warehouse. In front of the “celebrity case,” where Lucy Ricardo’s Franciscan Ivy pattern from “I Love Lucy” shared space with Whoopi Goldberg’s ornate Royal Crown Derby’s Imari, I realized that I’d taken us 15 minutes beyond the allotted half hour. Gorman dropped me off at the museum area at the back of the showroom, which contains more than 2,000 rare, not-for-sale pieces. I lingered there another 10 minutes. Two hours after I’d arrived, I tracked down Oliver for the reckoning. After trading stories about our dogs (her last one accompanied her to work, but the current one is too unruly), she returned a few chipped plates that I hadn’t noticed, some silver-plated items that she said wouldn’t sell, handed me a detailed list of everything I’d sold and cut me a check for $306.90. A free guided tour, with payout? That’s my kind of retail therapy. Retail store open 9 a.m. to 7 p.m. daily. Self-guided tours go through shop, museum and Great Wall of China. Free guided tours run on the half hour from 9:30 a.m. to 6 p.m. Walk-in sales run Monday through Saturday, 9 a.m. to 5 p.m., with appointments recommended but not required. This entry was posted on May 24, 2014 at 2:36 pm and is filed under Consumer rave, Environmental, Family travel, North Carolina, Road travel. You can follow any responses to this entry through the RSS 2.0 feed. You can leave a response, or trackback from your own site.